One of the problems with suitcases of previous years, is the fact that very often, they were heavy before you even put anything inside. They were also very cumbersome and didn’t have wheels most of the time. Today’s modern suitcases have addressed many of these issues. They are still as strong as ever, but they have become lighter. They often have wheels and a handle so you can pull them along instead of using those luggage trollies. This list features the top three spinner suitcases that are on the market at the moment. It will detail the best each suitcase has to offer as well as going through some of the specifications. 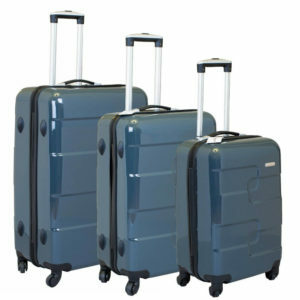 This set of three suitcases made by Aerolite claims to be the world’s lightest piece of luggage. They are durable and have many features you would expect from a heavier type of case. Let us take a look at some of its other features. 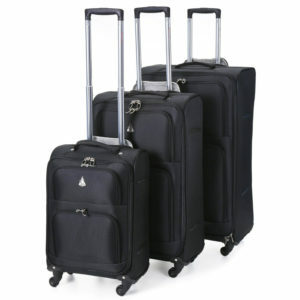 The Aerolite brand has been renowned for producing luggage that is very light. They have developed a range of strong suitcases that allow people to carry more clothes than they could before with the same size case. This reduces the chances of having to pay an extra baggage fee. This three piece set has a small case that is designed to adhere to cabin baggage requirements. This means you don’t have to worry about taking another bag with you for the cabin. Each bag is fitted with four wheels, one in each of the corners. These are able to turn 360 degrees, giving you good manoeuvrability and stability. The wheels are also very strong so you won’t have to worry about them breaking during transit. The cases are made from a tough polyester material that is both light and hardwearing. It is also water resistant to protect your belongings while you are travelling. This high quality material will resist and knocks and scrapes the cases may encounter on their journey. Inside the cases are many compartments and pockets for you to store all the clothes and other loose items. It also allows you to keep things separate to make things easier when you unpack. Internal straps will hold the items in place to stop them moving around and getting damaged. The Aerolite Lightweight Suitcase 9915 is a nice set that are practical and strong. They offer a lot of storage capacity and a clever use of materials to keep weight down. These nice looking suitcases are a set of three made by Vesgantti. They are well made and will be great for a family holiday. They are in three different sizes so you can mix and match them depending on how much you need to take. Here are a few of the other features. The three sizes are ideal for many types of holiday together or individually. The small one measures 39cm wide, 58cm tall and 24cm deep. This is ideal for overnight trips or business use. The other two measure 46cm by 68cm by 26cm for the medium one and 53cm by 78cm by 29cm for the large case. All the cases are made from a lightweight ABS and plastic construction. This gives them strength and will protect your things from damage during transit. As an added benefit, they are also water resistant. Each case is fitted with four wheels. These are placed in each corner for added stability and ease of movement. It means you won’t have to carry your bags around or rely on a luggage trolley. They are strong enough to cope with temperatures from -25°C to 80°C. This means you can take them on skiing trips or to a sun drenched island without any problems. The Vesgantti Light Weight Hard Sided Travel Luggage is a nice set of family suitcases. The combination of sizes means that they can be used in many different ways depending on the trip. They are spacious and come with securing straps inside to hold your clothes during travel. This next product is designed for the overnight stay or business trip. The Executive Business Bag is tough but also easy to handle and has a large capacity. It also comes in a range of funky colours so you can’t miss it at the airport. Here are some of its other features. This case is the perfect companion if you are going on an overnight stay or just travelling for business. It is small enough to be easy to take with you, but big enough to hold everything you might need. The tough ABS shell is waterproof and lightweight. It will protect your belongings from any bumps and scratches it may get along the way. This is why it is a good bag for short trips, it is durable enough to be used many times. It has four wheels that are located at each corner of the case. These are made from high quality plastic and can withstand uneven surfaces without breaking. It also makes the case very sturdy when it is being wheeled along. Inside the case is a fully lined compartment that has securing straps to hold your things in place while moving. This will keep all your carefully ironed clothes flat and loose items safe. If you are the type of person that travels a lot for work or likes to have regular breaks, this could be the suitcase for you. The Executive Business Bag is a lightweight aluminium and ABS case that can accommodate a fair amount of items. The top spot on the list goes to the Aerolite Lightweight Suitcase set of three. They are extremely light but also durable and come with many compartments and pockets. The carry handle can retract into the case and be zipped up to prevent damage. Overall they are a useful and elegant looking set of suitcases that should last a long time.